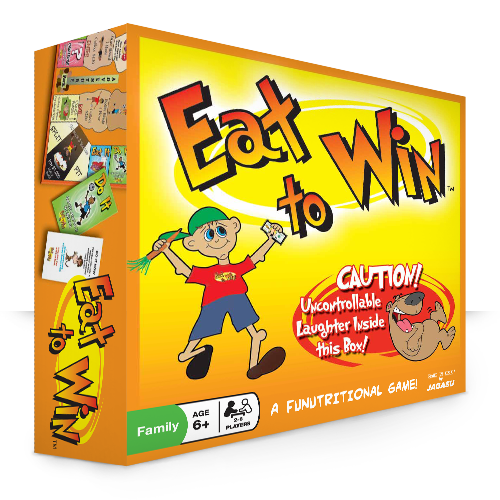 Eat to Win Board Game is a fun interactive board game for the whole family! 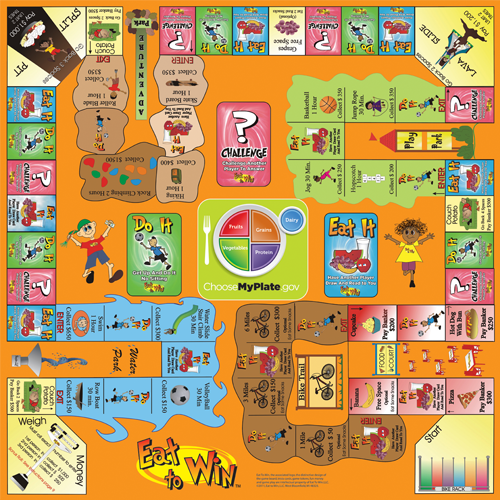 Get Health-i-Cational with this nutrition based board game. Geared for ages 6-13 but is fun for the entire family to play. I sat down with my 'littles' aged 6, 9, 11 and we set up for a great game time. This game in my opinion has some characteristics of Life. You are working your way through, sometimes choosing cards where you pay, and other times getting rewarded, based on what food you land on. The Eat It cards ask a question based on nutrition and if you choose the right answer you get paid. The Do It cards give you a task to do like, the fly around the room like an airplane or dance like a chicken. There are some cards that drag all of us in to the activity. Here Maverick was dancing like a chicken. Shiloh is running in place and singing a song. There were several cards that said to "choose your favorite activity and do it". These were a little harder for the kids to think up things to do. I would have rather liked to see some additional variations rather than choose your own. The activities they did have were great and they tired me out at times! A great board game to get some exercise as well. The goal is to have the most money at the end of the game. You gain money by landing on healthy eating and healthy activities. The amount of money you get is similar to the amount of calories burned in the activity. Similar when you have to pay it is based on the calorie count for the not so healthy snack. I really liked the Eat It questions, and I think as we play more the kids will learn the correct answers and be able to utilize those in their lifestyle.